Aiseesoft MXF Converter is able to convert Panasonic DVCPRO P2/ Sony XDCAM/ Canon XF camcorder MXF recordings and HD videos like TS, MTS, M2TS, TP, TRP to all popular video(MPG, MPEG-1, MPEG-2, MPEG-4, H.264, H.264/MPEG-4 AVC, etc) and audio(AIFF, FLAC, AMR, AAC, AC3, M4A, MP2, MP3, OGG, WAV, WMA) formats. 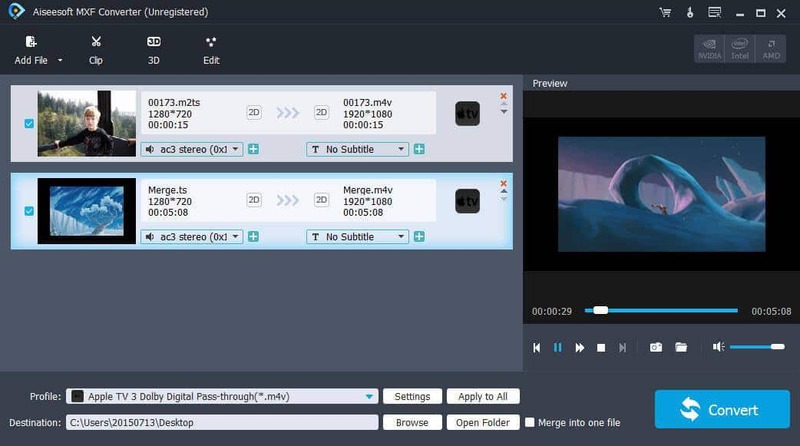 Also it can assist users to convert MXF videos to MP4, MKV, TS, AVI, and FLV 3D video formats. Now,it highly supports iphone 7/7 Plus,6s/6s Plus/5s/5c,iPad mini 3, iPad Air 2, Microsoft Surface and Samsung Galaxy Note 5.